For many years, Slideways Go Karting Brisbane has been a favourite holiday activity in Brisbane… The reason is simple: we continue to provide the city’s best go karting experience! 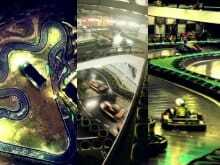 Our Slideways indoor go karting tracks are all about the driving experience. At the heart of this is our unique track surface, which means you can drift our 9hp European Sodi race karts at speeds of up to 70km/h! Having the best track surface and racing go karts would mean nothing without the best circuit layout. Our 400m long Brisbane configuration features an awesome cross over bridge, fast sweepers and challenging hairpins. To make a day at Slideways Go Karting Brisbane stress free for parents, we take safety very seriously, with all drivers fully briefed prior to taking the track, while the karts feature state of the art safety systems. Being indoors, we have an advantage over the competition of being open rain, hail or shine, 7 days a week from 10am to 10pm, so you can plan ahead your go karting with confidence. Not only do we have arrive and drive general karting for groups of under ten, but we also specialise in group go karting package deals, where we ensure you get the race track to yourself. Our function room overlooking the venue is also available for use by groups, where you can take in all of the action from air conditioned comfort. We are conveniently located at 870 Kingsford Smith Drive in Eagle Farm, which is 10 minutes from Brisbane City, and only five minutes to Brisbane Airport, with convenient public transport links nearby. As always, when it’s busy during school holidays and on Friday/Saturday/Sunday, we recommend phoning ahead to check for available track time on (07) 3868 2225.